The Neo-Victorians, on view now at the Hudson River Museum, presents a multi-faceted array of contemporary artists engaging with a Victorian-era aesthetic. The exhibition presents artists by arranging them in themes, such as the artist as “…naturalist, the artist as purveyor of the fantastical, and the artist as explorer of domesticity.” The exhibition, curated by Lehman College Galleries Executive Director Bartholomew F. Bland, is a whimsical and rewarding journey into the past that firmly communicates a contemporary viewpoint. Firmly enmeshed in this contemporary re-visioning of the period lies the works of artist Camille Eskell. Identifying as Iraqi-Jewish-American and with family roots in India, Eskell’s work is in dialogue with a multi-cultural aesthetic, carefully balancing the conceptual weight of identity. The artist describes in her own words her impulse to “explore the psychological legacy that shaped [her] perceptions, identity, and motivations.” Expanding her own sense of self-awareness extends to various aptitudes of form, allowing a range of materials and imagery to shape-shift. Eskell summons her compositions together from disparate parts. The artist works across multiple mediums by incorporating sculpture, fabric and found objects together into her mixed-media creations. Eskell incorporates rich visual legacies into her work, at times literally weaving together her family’s history with her own lived experience. The tactile qualities of her objects juxtapose firm with soft, malleable with brittle. Resin and colored pencil blend with unexpected objects, such as dentures. This wide array of materials indicates an intimacy firmly grounding the artist’s approach. 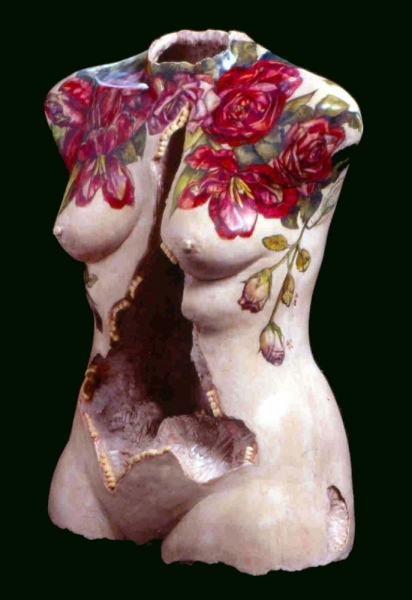 In Tattooed Lady: Comin’ up Roses, Eskell creates a fictional female torso beautifully adorned in flowers, yet torn asunder: ripped open to reveal the cavernous hollow beneath the skin’s surface. The artist recalls the role that women in her family assumed, maintaining the household, remaining auxiliary to the men in the family. Teeth embedded in the woman’s flesh seem to reveal the metaphorical state of being eaten alive: of being digested by that which is also holding one’s body together. The artist’s work interestingly incorporates actual images and portraits of her own family members, commenting on a shared experience through a direct, personal lens. The melange of iconography relates to her family’s livelihood and international influences. Embroidery and traditional craft complement the images of family members, as always highlighting the male lineage. As a female artist working within these confines, Eskell rebelliously asserts herself in spite of these hierarchical expectations. Through representing the continuum of conservative culture in her constructions, yet layering it within her own artistic insights, the artist deftly subjects this consideration of traditional gender roles to her exacting gaze. Fluid yet firm, Eskell questions the place of women, and female bodies, within the cultural norms she was raised to ascribe to. Eskell has shown at the Hudson Valley Center for Contemporary Art, ODETTA, David&Schweitzer, and the Chrysler Museum, among other venues. She was recently recognized as a recipient of the prestigious Artist Fellowship Excellence Award from the Connecticut state office of the Arts in 2018. Eskell’s work has been exhibited internationally throughout Mexico, South America and Wales. Eskell holds an MFA in Fine Arts from Queens College, and lives and works in Connecticut.